The control of silicon carbide heaters in industrial heating processes may initially appear complex. But by understanding a few simple concepts and choosing the right equipment, you can achieve accurate and reliable control. This information is for general purposes only, please contact us on 03 9720 4522 or sales@practicalcontrol.com.au to discuss your specific requirements. Silicon carbide heaters are normally used in high temperature furnaces and have a resistance that varies with time and also with temperature. As temperature increases, heater resistance follows a negative temperature coefficient until it drops to a low point (typically around 600ºC to 900ºC). From that point on resistance increases with temperature. In addition to temperature-dependent resistance, silicon carbide heaters also increase in resistance with age. Silicon carbide heaters have a maximum allowable watt density determined by maximum temperature and operating atmosphere. Chemically aggressive atmospheres will limit both the maximum operating temperature and the allowable watt density. When specifying switchgear, cabling and controls it is important to remember that with new silicon carbide heaters that the furnace will develop full power at a reduced voltage (typically half the available line voltage). Thus, for a 30kW heating load with heaters arranged in delta configuration and a starting voltage of 270V, the line current will be 64.15 amps, compared to 41.67 amps if the heaters developed their full power at 415V. Because the resistance of silicon carbide heaters increases with age, it becomes necessary to increase the available voltage applied to them in order to maintain maximum available power. To do this there must be sufficient voltage headroom or reserve. Typically a voltage headroom of 100% must be provided so that the heater life can be maximised. If insufficient voltage reserve is available then as the elements age full line voltage will be applied to them but this voltage will be insufficient to develop full power. When designing your furnace, you will need to consult your heater element manufacturer's data to determine whether you have adequate voltage reserve. New low resistance silicon carbide heaters are operated initially at a low "starting" voltage that is gradually increased to a higher finishing voltage where the heaters have reached their maximum resistance and are at the end of their useful life. Silicon carbide heaters are typically controlled by thyristor power controllers (also known as SCRs or silicon controlled rectifiers) with power feedback. In power feedback mode the thyristor measures output current and voltage, takes the product of these two measurements and then regulates the power output so that it is proportional to the control input. The benefit of this is that as the heaters age and their resistance increases, the thyristor will automatically increase the output voltage to maintain constant power with no intervention required by the user over the life of the heaters. As the silicon carbide heaters heat up from ambient temperature they have a negative temperature coefficient, with resistance decreasing as temperature rises in the initial part of the curve, up to the point at about 600ºC where heater resistance increases with temperature. During the initial negative temperature coefficient phase the thyristor is usually run in voltage feedback mode to avoid subjecting the heaters to thermal shock, then switches over to power feedback mode as the heaters reach the positive temperature coefficient phase. From a cold start the temperature controller will give maximum output, attempting to bring the furnace to setpoint. With the thyristor in voltage feedback mode the voltage applied to the heaters is proportional to the temperature controller output / thyristor control input. The maximum allowable heater starting voltage is programmed into the thyristor and this corresponds to the maximum voltage output of the thyristor. This avoids the heaters being exposed to excessive voltage when cold. Because the initial heater cold resistance is high, the power fed into the heaters is initially low and then increases gradually as heater temperature rises and heater resistance drops (that is, Power = V2/R), resulting in a gentle power delivery to the heaters. CD Automation thyristors can easily be configured to switch over from voltage to power feedback via a digital input that is switched by an external contact (typically an alarm relay on a temperature controller) or via their Modbus communications port. There are two types of thyristor firing modes, phase angle and burst control. Many CD Automation thyristors are configurable to run in either burst or phase angle modes. Click here for a video demonstration of the two firing modes. Phase angle control turns the thyristor on at a variable point in the AC cycle according to the control input of the thyristor. With a control input signal of 100%, the thyristor will allow through complete AC sine waves of current. At 50% input only half a sine wave will be seen by the load. Phase control thyristors give smooth and constantly variable control of the applied heater voltage and thus are well suited for use with silicon carbide heaters. Phase control can cause some supply distortion due to harmonics. This distortion can often be mitigated by relatively simple means, such as line reactors or by using transformers to match the line voltage to the required heater load voltage. Another means of reducing harmonic distortion is by running the heaters in six wire delta configuration. This causes the 3rd, 6th, 9th etc. harmonics to cancel each other out. Burst control switches through complete packets of AC sine waves in proportion to the control input signal. At 0% input the thyristor will be completely off. At 50% output the thyristor will be on half the time and off half the time, at 75% the thyristor will be on 75% of the time and off 25% of the time and at 100% the thyristor will be fully on. Traditionally thyristors used for the control of silicon carbide heaters have been phase angle control, although recent innovations allow burst fire thyristors to be used as well. Burst control thyristors used with silicon carbide heaters need to have a short time base. Even though the average power delivered to the heaters may well be within the heater's Watt density rating, the heater's watt density rating may well be exceeded during the on time period. If, for example, a slow cycle burst thyristor had a 30 second time base, the heater would be on for 15s and exposed to the full mains voltage over that time period, causing it to fail prematurely. CD Automation thyristors can be operated in a single cycle burst mode which is optimum for silicon carbide heaters. At 50% output the thyristor is one cycle on, one cycle off, i.e. 0.02s on, 0.02s off (at 50Hz) which minimises the risk of over-stressing the silicon carbide heater during the on period. Because burst control subjects the silicon carbide heaters to full mains voltage when bursting on, the peak currents through the thyristors are higher than they would be if they were subjected to the reduced voltage obtained by phase control. 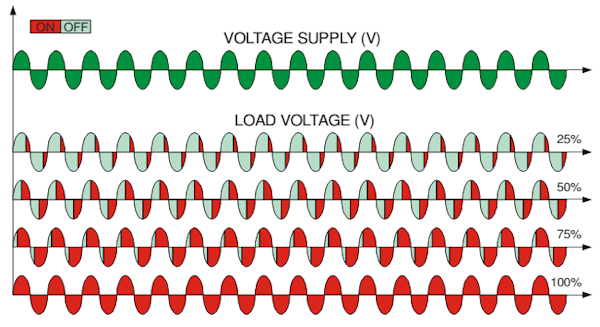 The thyristor must be sized to accommodate this higher peak current. 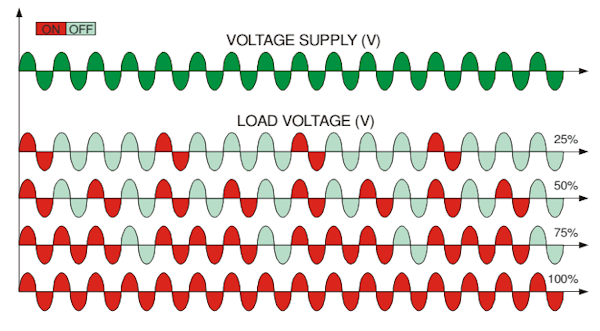 As a result a burst firing thyristor used with silicon carbide heaters must have a considerably higher current rating than a phase control thyristor controlling the same load. Current rating is determined by dividing the RMS supply voltage by the minimum network resistance. i.e. Current rating = supply voltage / minimum resistance . √(9000W/2.5Ω) = 60 amps at a corresponding voltage of 9000W/60A= 150V. The burst controlling thyristor limits maximum power by limiting the on time of the heater. If the starting voltage of the silicon carbide heaters is significantly below half the available line voltage, it is usually beneficial to use a transformer to supply the load. The transformer is usually specified so that the voltage output on the secondary is equal to the finishing voltage of the silicon carbide heaters. Unlike a thyristor, a transformer will not draw more current on the input side to give a reduced output on the output side. For a transformer, VpIp=VsIs (where Vp = primary voltage, Ip = primary current, Vs = secondary voltage, Is = secondary current). Consider the example of a 1000W silicon carbide heating load with a 220V mains supply, 70V starting voltage, 120V finishing voltage. With a tapped transformer set at 70V for a new heater element, the secondary current (Is) is 1000W/70V = 14.29 amps, with a corresponding primary current (Ip) of 70V/220V x 14.29 amps = 4.54 amps. At the end of the heater's life, with the transformer secondary tapping set to 120V, the secondary current (Is) will be 1000W/120V = 8.33 amps, with a corresponding primary (mains) current of 120V/220V x 8.33amps = 4.54amps. From this it can be seen that if we change the transformer tapping to match the load resistance for any given power output the primary current draw remains constant. Now consider the case where we have no transformer and use a thyristor only to regulate voltage to the load. Mains current draw for a new silicon carbide heater with thyristor output set to 70V will be 1000W/70V = 14.29 amps. Mains current draw with the heater at the end of its life and thyristor output set to 120V will be 1000W/120V = 8.33 amps. It is clear that a transformer greatly reduces the mains current draw by matching the required load voltage to the load impedence. Typically, a transformer and thyristor are combined to control low resistance silicon carbide heaters. This gives the benefit of both reduced mains current draw due to the transformer and the power regulation/automatic compensation for element ageing offered by the thyristor. If we use a transformer with a 120V secondary, the finishing voltage of the heaters, and combine it with a thyristor on the transformer primary, we get a starting secondary current of 1000W/70V = 14.29amps with a primary (mains) current of 120V/220V x 14.29A = 7.79 amps. Furnace design begins with determining the required power and selecting silicon carbide heaters that can meet that requirement. Once the silicon carbide heaters have been selected the starting voltage of the furnace can be determined. With the starting voltage known, the starting current can be calculated. This will be when maximum current is drawn by the furnace. Where multiple heaters are used they can often be arranged in series to maximise starting voltage and minimise starting current. Conductors and switchgear must be specified using this higher starting current. Adequate voltage "headroom" or reserve must remain to allow the silicon carbide heaters to age. If the starting voltage is less than half the available mains voltage the use of a transformer should be considered.